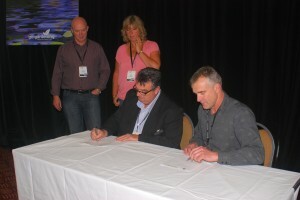 Craig Norman (NGIA President) and Vince Wylaars (NGINZ President) sign MoU. Glenn Fenton (NGIA Vice President) and Kate Hillier (NGINZ Vice-President) observe. The Executive of Nursery & Garden Industry Australia (NGIA), representing the industry at a national level, and the Executive of the Nursery and Garden Industry Association of New Zealand (NGINZ) recently signed a memorandum of understanding (MoU) at the NGINZ Conference. Promote and further the interests of the nursery and garden industry and allied industries in the Commonwealth of Australia and New Zealand. Assist and/or to promote horticultural education, skills development and employment opportunities in the area of lifestyle horticulture. Work together to identify areas of research that may be beneficial for cooperation between countries. Promote, seek or oppose legislation or other measures that may affect the interests of nurserypersons, garden industry or allied industries. Arrange for distribution to industry stakeholders and members, information and commodities deemed necessary for the development of the associated trades. Maintain dialogue with all Government and semi-government departments in the advancement of technical data covering the nursery, landscape-horticultural and allied fields of activity as it relates to markets and potential trade. The MoU is a concrete step towards fostering a closer cooperation between both parties enabling the sharing of expertise, exchange of ideas as well as providing heightened levels of advocacy on key issues. Discussions are already underway on progressing key aspects of the MoU. For more information, please contact Robert Prince, NGIA CEO Robert.prince@ngia.com.au .